Gaspar's Marinated Meat Spice Mix 8 oz. 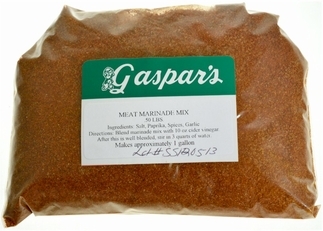 Home Local Favorites Gaspar's Marinated Meat Spice Mix 8 oz. A blend of spices that you can trust will deliver the taste you want. Makes your meats tender and flavorful. Simply add the recommended cider vinegar, water and this blend of spices to create a flavor your family will enjoy. Packed in a clear resealable bag. Great on steak, ribs, beef, and pork. Ingredients: salt, paprika, spices, garlic Directions: Blend marinade mix with 10 oz. cider vinegar. After this is well blended, stir in 3 quarts of water. Makes approximately 1 gallon. Please Read Shipping Terms and Conditions Before Ordering. All Gaspar's Marinated Meat Spice Mix are special ordered and shipped on Tuesday.